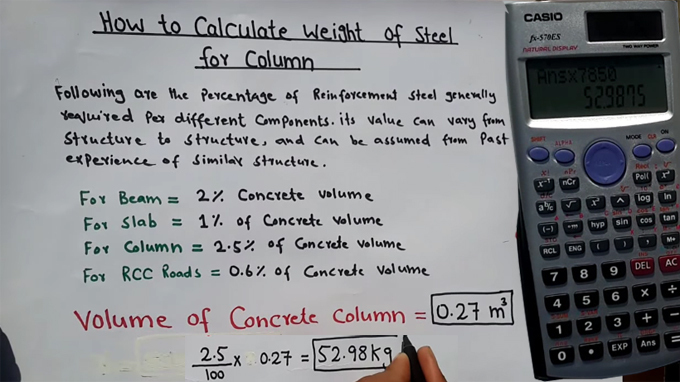 This construction video provides valuable tips for estimating weight of steel for column. Here, the calculation is made on the basis of a previous column diagram. The dimension of the column = 300 mm x 300 mm = 0.3 meter. The height of the column is 3 meter. If, these 3 dimensions are multiplied with each other, the value obtained for the concrete of this column will be 0.27 m3. Given below, the detailed percentage of reinforcement steel usually essential for various components. It’s value can differentiate from structure to structure. Watch the video to get the full details.